It could be said that 2018 was a mixed bag for unions and the labor movement. The Supreme Court’s Janus v. AFSCME decision was a direct attack on public sector unions and President Trump went after federal employees’ workplace rights with three executive orders, while union approval reached a 15-year high at 62 percent. 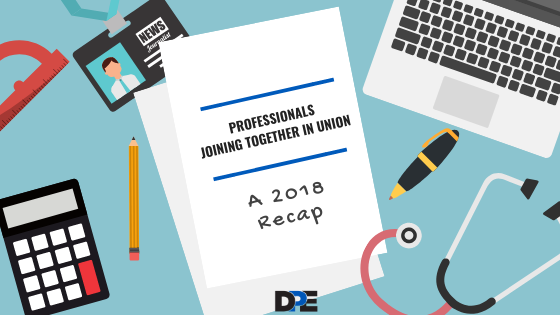 A better way to recap 2018 for professional union members is to look at the employees who chose to join together in union. In Seattle, public media professionals at KUOW organized to improve their pay due to the costs associated with living in an increasingly expensive city and to have a greater say in their newsroom. Employees at Hawaii Water also decided to come together to improve their pay. Hawaii Water employees learned unionized employees at another water utility were earning considerably more and realized they could raise their pay with a union too. For employees at Texas’ largest independent bookstore BookPeople, joining together in union wasn’t just about improving pay but also benefits. The staff of 80 booksellers, event staff, and inventory managers joined together in union to make the store better for customers and employees. With their union, BookPeople’s employees will negotiate for higher wages and better benefits to ensure the bookstore is a place they will continue to want to work. Many professionals that organized this year were motivated by concerns with working conditions. Faculty at Oregon State University joined together in union after witnessing their working conditions deteriorate and the university increasingly rely on contingent faculty. They will have a greater say in university governance and a way to secure better working conditions with their union. Digital journalists at Fast Company value their collaborative, innovative, and nurturing workplace and came together to preserve it. In a tumultuous time for digital media, they viewed unionizing as the most effective way to maintain the best aspects of their workplace and have voice in how it evolves. Vermont Symphony Orchestra musicians’ move to unionize came during a time of changes too and they also joined together to have a voice in the process. Additionally, the musicians were attracted to joining the larger community of unionized orchestras and having access to its resources. One way to recap 2018 is to say professionals are still realizing there is power in a union. SAG-AFTRA has continued to put resources into organizing new bargaining units in all the areas of covered work in 2018. That investment led to some historic victories that will help shape the future of media workers in the 21st century — and beyond. With middle-class union jobs increasingly under attack and existing contracts under the threat of non-union work, SAG-AFTRA took a proactive strategy that will continue to pay dividends. In February, employees at public radio station KUOW in Seattle won union recognition as a new bargaining unit, including the station’s announcers, hosts, producers and reporters, as well as digital and community engagement staff. This was just the latest in a string of organizing campaigns in public radio in recent years that have brought in hundreds of new members at stations including KPCC in Pasadena, WBEZ in Chicago, KPBS in San Diego, and Minnesota Public Radio. In September, on-air talent at Spanish-language radio station La Ley 107.9 (WLEY-FM) in Chicago, owned by Spanish Broadcasting System, voted overwhelmingly to organize with SAG-AFTRA. This was the latest milestone in SAG-AFTRA’s campaign to organize the Spanish-language media industries, and following successes in recent years with radio stations Mega and La Raza in Los Angeles, Telemundo Studios telenovela actors, and multiple Telemundo award shows. In October, content creators at Al Jazeera English (AJE), based in the United States, voted overwhelmingly to recognize SAG-AFTRA as their union. AJE programs that will now be covered by SAG-AFTRA include the recent Emmy award-winning show Fault Lines, The Stream, Witness, Up Front and People & Power, to name a few. SAG-AFTRA and New York Public Radio (NYPR) in August reached an agreement to add per diem and temporary employees working in SAG-AFTRA covered titles to the union’s longstanding contract, which adds some 30 people to the more than 100 full-time workers at NYPR covered by the union. The deal came after the unit made the request to unionize on July 12, 2018. Also in 2018, SAG-AFTRA achieved a historic first contract with Telemundo Studios. The contract marks a breakthrough after fifteen months of negotiations that followed a vote by Telemundo performers to unionize on March 8, 2017. Other broadcast organizing victories for SAG-AFTRA in 2018 included a unit of producers and news editors who work for Entercom radio stations KDKA-AM and KDKA-FM in Pittsburgh, and traffic reporters with TTWN in Portland, Oregon. SAG-AFTRA began 2018 with a newly organized unit of audiobook narrators working for ListenUp Audiobooks in Atlanta. SAG-AFTRA now represents hundreds of audiobook narrators across dozens of bargaining units that have been organized in recent years. SAG-AFTRA doubled our signatory numbers between 2017 and 2018 and have continued to increase signatories to our low-budget agreement since its creation. Besides the historic agreement with SVOD service Zeus, and working with other content creators, our focus has been on signing dramatic and non-dramatic podcasts. We signed our first podcast in spring 2018. Since then we have been signing and organizing podcast productions consistently. SAG-AFTRA created the Low Budget Digital Waiver to address concerns that digital work was going non-union. The result has been an increase in digital work as well as an introduction for advertisers who have never used SAG-AFTRA members before to experience professional talent. Additionally, we reworked our Commercial Regional Codes(also known as “made-in played-in” work) creating more work opportunities for performers outside of the major markets.